Ancient: diptych, oil pastel and ink on Arches paper. Each panel 120cm x 75. Creek Line 5: rust, oil pastel and ink on Arches paper. Creek Line 4: Rust, oil pastel and ink on Arches paper. On the Wing: Handmade book of digital prints on Hanemulle paper, laser cut. Aluminium, and felt stand. River Line Moonlit: Rust, oil pastel and ink on Arches paper. Burnt River: Rust ink and oil pastel on Arches paper. River Line: Ink and oil pastel on Arches paper. Above Ormiston Gorge: Handmade concertina book, ink on Arches paper. Above Ruby Gap: Handmade concertina book, ink on Arches paper. With Wings (Black Swan): Llimited edition digital print on archival rag paper. With Wings (Brown Falcon): Llimited edition digital print on archival rag paper. With Wings (Barn Owl): Llimited edition digital print on archival rag paper. ‘Up In the air’ was my solo exhibition at Araluen, the Regional Gallery in Alice Springs, 2013. 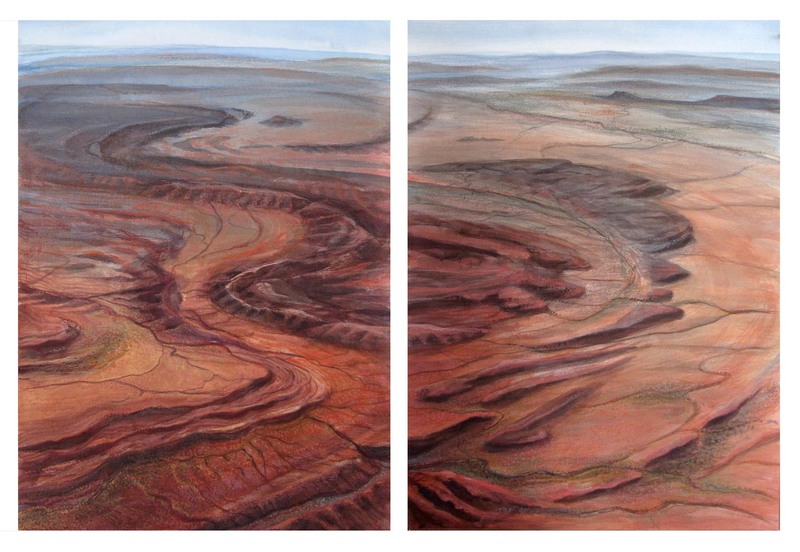 The original idea was to present the landscape of arid Australia as seen from above. Works were mixed media, oil pastel, acrylic ink and rust on watercolour paper. I developed my own method for ‘rusting’ watercolour paper that mimics the natural process of rust, a fundamental aspect of this environment. I included a collection of mounted bird wings to reiterate the aerial perspective, and to give flight to the longing we all seem to have for the view from above. This collection of wings grew as I painted the works and required a special license from National Parks and Wildlife. I harvested the wings from dead birds, mostly road casualties, that the Wild Care worker was sadly unable to save. The birds became the muses for my work. To echo the wings I created a soundscape of birdcalls. Also included was a handmade book of my aerial photographs, in the shape of a wing. I wore a silk cape that I printed with the wings of the Barn Owl, to the opening.